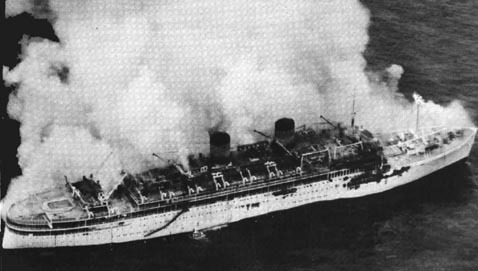 What began as a Christmas festive cruise aboard the Greek liner Lakonia in 1963, ended in disaster when the 20,000-ton vessel caught fire and burned in the Atlantic Ocean, about 180 miles off the island of Madeira. 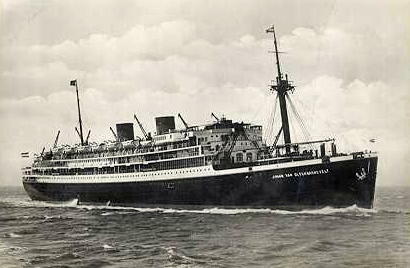 The liner sailed from Southampton on December 19 with 1,022 passengers, bound for the Atlantic Islands. Three days later it was dead in the water and ablaze, with passengers escaping in the few lifeboats that could be launched, or jumping into the water to escape the flames, while nearby vessels raced to their rescue. An estimated 95 passengers and 33 crew members perished in the fire that consumed and eventually sank the ship. Investigation revealed that the lifeboats were not in working order, the captain, Mathios Zarbis seemed incapable of handling the emergency, and the ship’s crew failed to respond quickly enough when the fire was discovered. The fire was first noticed coming from under a door of the ship’s hairdressing salon. Two stewards rushed in with small extinguishers and attempted unsuccessfully to put out the blaze before sounding an alarm. By the time they called for help the fire was out of control. Testimony presented by eye-witnesses later led researchers to believe the fire started from an electrical short in the engine room. The aft stack passed through the barbershop adjoining the salon and this is where the fire was first noticed. The fire ravaged the superstructure of the 33-year-old liner as crew members and passengers scrambled to save themselves. They said the skipper seemed unable to decide what to do. After an SOS was sent, Zarbis ordered all of the passengers into a large dining room, located three decks below the promenade deck and close to the fire. Fortunately, most of the passengers ignored the order and remained out of danger. Finally, as the fire gained, Captain Zarbis issued the order to lower the lifeboats. There were 24 davits with more than enough boats to handle the entire passenger roster and crew. But the davits were rusted and many of them failed to work. The safety equipment aboard the ship had long been neglected. Thus 128 people were left behind on the burning vessel to perish. The rest got away in the lifeboats and were picked up by other ships that responded to the emergency call. 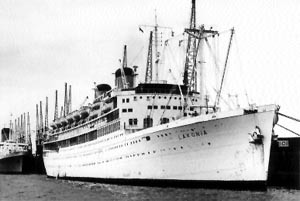 The abandoned Lakonia was taken under tow for a while, but it eventually sank. A Greek board of inquiry blamed all of the deaths to the improper organization and leadership of Captain Zarbis and his officers. The liner was originally a Dutch ship that bore the longest name ever given a vessel at sea: the Johan van Oldenbarnevelt. Launched in 1930, the ship had a long and distinguished career as a Dutch passenger liner making routine trips between Europe and Australia. She also saw service in World War II as an allied troopship. The ship was sold to the Greek shipping company in 1962 and refitted for regular cruises from Southampton.